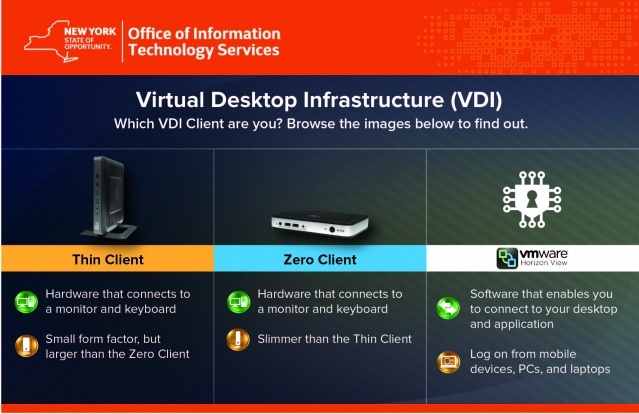 To learn more about VDI, click here. 1. At the login warning screen, select OK to accept disclaimer. 2. When prompted, enter your NYS user name and password. 3.If prompted for server address, enter desktop.ny.gov. 4. If an ITS Desktop User Experience icon shows up, double-click the icon. 5. Select OK. You will now be presented with your VDI desktop. 1. Enter desktop.ny.gov in the Server text box, click Connect. 2. Enter your NYS user name and password, click Login. 3. Select ITS Desktop User Experience and then Connect. 4. A disclaimer screen will appear, click Ok and you will arrive at your VDI desktop. 2. Select the option to Install the VMWare Horizon Client Software. Click Run. 3. Follow all prompts for installing the Client. If prompted for type of Internet address select IPV4. If prompted to enter default server name, enter desktop.ny.gov . 4. Once successfully installed, click "Finish". 5. Click "Yes" to restart your computer. 1. Click the VMWare Horizon Client icon on your desktop. 2. Double-click the desktop.ny.gov server icon. If you do not see the desktop.ny.gov icon, click the + New Server button and enter the address when prompted. 3. Enter your username and password. Select your agency from the Domain Drop Down menu. Note: Username is typically first initial and last name. 4. Double-click Agency VDI icon. 5. Select OK to accept the Security disclaimer. 6. You will see the Windows PC logon screen. Use the menu bar at the top of your screen to access setup options or use a USB device. 7. If your screen freezes and you are prompted to enter Ctrl-Alt-Delete, click +Send Ctrl-Alt-Delete in the top menu bar. 1. Click the Start button in the task bar. 3. Click on Word 2013 or another program you would like to use. 1. Double-click the Outlook Web Access icon on your desktop. 2. If prompted to disable add-ons, click Ask me later, then select Don't disable. 3. Use your existing Office 365 email address and password. 3. Click on Outlook 2013. 4. Use your existing Office 365 email address and password. 5. Wait for O365 to download your email to the client the first time you use the Outlook client. Reset any previous settings, including your signature and other email options. Virtual desktop infrastructure (VDI) is the practice of running a user's desktop inside a virtual machine that lives on a server in a datacenter. All profile settings, installed applications, and the operating system are stored and managed centrally. Why is the state migrating toward enterprise VDI? Virtual Desktop Infrastructure is a positive move toward the future, and aligns with ITS efforts to consolidate and centralize IT resources. VDI streamlines support and reduces costs, while at the same time enables users to access virtual desktops anytime, from anywhere. Can a user remote into their desktop computer from home? Users will need to log into VDI, and then select the Remote Desktop Connection link to remote to their desktop computer. You will need to know your computer name and domain. You can find your computer name by clicking Start, then Computer and looking in the lower left corner of the window. You will enter the computer name before the domain it reside in (its.ny.gov). Example: If your computer name is ESDAPP722, you will enter ESDAPP722.its.ny.gov. When I log on using VDI all of my icons are gone, what do I do? You may need to restart your session. Select Logoff or Restart. Wait 4 -5 minutes after restarting and log back in. Your icons should be restored. If that does not correct the issue, contact the Enterprise Service Desk or your local Service Desk. My VDI session froze. How do I get back in to the VDI session? Use the "send Ctrl-Alt-Delete" button at the top of the session to unlock the computer. Turn off the device, wait 4-5 minutes and try logging back on. Your session should restart with a new virtual machine (new desktop).